NEW YORK—On Oct. 1, 2009, a man the New York Times called one of New York’s “real mayors” looked down on the Chinese military as it marched past his seat on the reviewing stand in the Gate Tower of Tiananmen during the 60th anniversary celebration of the Chinese Communist Party. That special seating area is reserved for elites of the Chinese Communist Party and key people doing United Front work. Chu’s seat at Tiananmen Square was a reward. He has demonstrated his support for the Chinese regime repeatedly over the years. Chu was one of the organizers of anti-American protests in New York after the United States accidentally bombed a Chinese Embassy in Yugoslavia in 1999. Cafferty’s comments set off a wave of protests by Chinese people in the United States. Chu was one of the protest organizers, working through an organization he heads. When the Dalai Lama was scheduled to give a speech at Colgate University in Hamilton, N.Y., also in April 2008, the Council of Chinese American Associations, of which Chu is general secretary, hired a pilot to circle Manhattan throughout the day in a propeller aircraft, pulling a banner that read “Tibet will always be part of China,” protesting the Dalai Lama’s visit. His business card says he’s the “commander” of the New York Defend Diaoyu Islands Anti-Japan Demonstrations. Chu has engaged in similar operations through the years. In June 2008 China News identified Chu as a “loyal and committed Marxist” who continued taking part in politics when he emigrated from Taiwan to New York in 1983. He has a travel agency, and is a busy man. His business card has nine titles on it. Chu has ties to two of China’s main departments for foreign espionage and propaganda, which are directly under the command of the top levels of the Chinese regime. In a phone call, Chu declined to comment. According to Chu’s business card, he is vice president of the New York Association for Peaceful Unification of China. The group is under China’s United Front Work Department, which answers to the highest levels of the Chinese Communist Party. One of its key roles is to expand the regime’s control of overseas communities, including in the United States. Chu was also appointed director of the China Oversea Exchange Association (COEA) on Sept. 30, 2009, according to reports from Chinese-language media. The COEA is under yet another of the Chinese regime’s offices for foreign espionage, the Overseas Chinese Affairs Office. The Overseas Chinese Affairs Office is under the State Council, the top level of the Chinese government. Its role is to monitor Chinese expats, and to control and influence foreign Chinese communities. Chu is the council chairman of the Chinese Anti-Cult World Alliance. The organization has the same materials and similar activities as the Chinese Anti-Cult Association inside China that works with the 610 Office. The 610 Office is the Party organ formed to monitor, arrest, torture, and “transform” people in China who practice Falun Gong. “Transformation” refers to forcing an individual to give up his or her beliefs and swear allegiance to the Communist Party. Inside China, the Chinese Anti-Cult Association (CACA) assists the 610 Office from the civilian side. It advises the Chinese regime on methods to persecute Falun Gong practitioners and organizes anti-Falun Gong hate campaigns. In the CACA’s most famous campaign it pressured everyone in China’s schools to sign a petition against Falun Gong and took the several million signatures to a U.N. conference. In New York, the Anti-Cult World Alliance plays a similar role to the CACA in China. Its members distribute materials defaming Falun Gong and its founder on a daily basis, and regularly harass Falun Gong practitioners. Chu’s role is directly in line with guidance from Cai Lijin, a public security official for Hunan Province and a member of the Anti-Cult Association inside China. In a report that was given a first-place award in 2011 by the CACA in Hunan, Cai said it’s not easy for the Chinese regime to extend its persecution of Falun Gong to other countries through official channels. To extend the regime’s persecution abroad, Cai said, requires creating anti-cult organizations on a local level in other countries. He suggested the Chinese regime could fund these systems through its controlled businesses. There’s one title Chu seems to have left off his business card. He has been a consultant for the All China Federation of Returned Overseas Chinese (ACFROC) since 2004, according to its website and Chinese-language media reports. ACFROC is under the Working Committee of central Chinese Communist Party. It’s one of few national-level organizations the Working Committee gives direct orders to. During a June 14 ACFROC meeting, according to its website, ACFROC president and Chinese Communist Party Secretary Lin Jun gave a speech on following the central Communist Party’s advice. He spoke about the role of its overseas liaison in carrying out the regime’s United Front work. 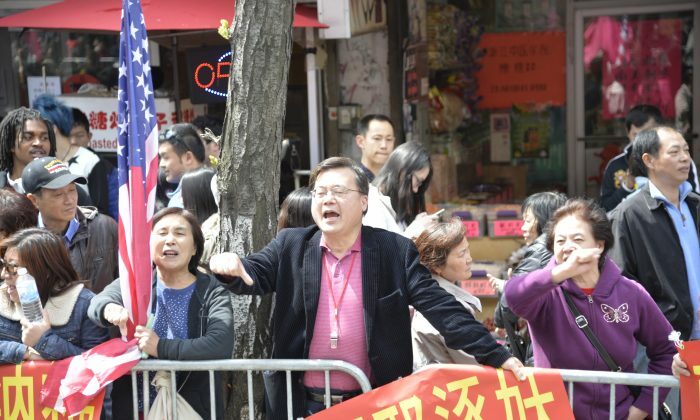 Many people in New York’s Chinese community have long assumed Chu has ties to the Chinese regime—mainly due to his activities and the contents of his newspaper. Generally, however, he’s just regarded as someone with a zealous obsession with the Chinese Communist Party and its policies. Many people in the community don’t take Chu seriously.